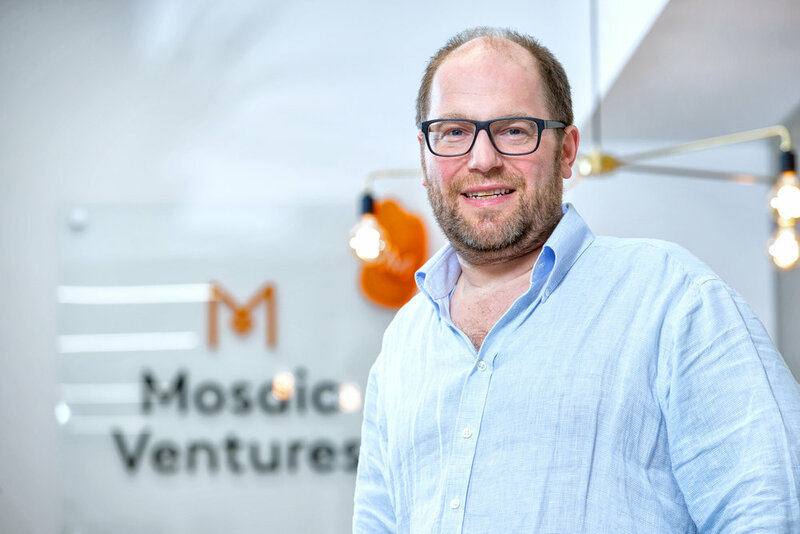 My name is Simon Levene and I am a co-founder and partner at Mosaic Ventures. I was born in London to a family of second/third generation immigrant-entrepreneurs – folks who came to the UK in some instances as refugees and on whose shoulders I stand. Aged 21, I moved to the US for grad school (politics, philosophy), just as the web was emerging, and stayed for over a decade. As an early adopter, in 1993 I downloaded Netscape’s Mosaic, the first browser, and began surfing the web with a 14.4k modem. It was an epiphany. After another stint at grad school earning an MBA, I headed west to Silicon Valley, the epicentre of the Internet ecosystem. From 1996-2000, I was an early employee at @Home Network, a startup founded in 1995 to pioneer the broadband Internet we take for granted today. Together with John O’Farrell (now also a VC), I co-founded @Home’s international business and then jointly led bus dev/corp dev for the international division. In four years this ramped to $70M revenue and 500 employees in 10 countries (as a whole, the company grew to 4,000 employees). @Home was one of the poster children of the first Internet wave, and flew high post-IPO before crashing due to a byzantine corporate ownership structure and an ill-fated merger with Excite. Lots of invaluable experience from those years, including working alongside a handpicked team of engineers and product managers/operators to scale a leading ISP service so rapidly. My friend and partner Toby Coppel, together with Jeff Weiner and Jerry Yang, recruited me to Yahoo! in 2001-2, where I spent four years as VP Corp Dev in a small team that came together following the dotcom crash. Yahoo! was then the #1 website globally with ~200M users, almost breaking even on $700M revenue, and a strong balance sheet. Corp dev were empowered by the board to help devise a new strategy for the company -- to evaluate every web product/service in every geography -- and determine whether to enter as a principal; and if yes, to build or buy. Yahoo! was a great platform from which to enter the nascent search and mobile businesses, and double down on shopping, travel, finance, geo/maps, voice, photos, games and many other emerging web “verticals”. It was intellectually fascinating to work alongside a deep bench of world-class talent across such wide-ranging consumer-facing applications, and deliver product to the web’s biggest audience. As a result of these operating experiences at Silicon Valley darlings (neither arguably realising their full potential), twice-over I am a member of a fantastic diaspora of alumni, represented at many exciting startups today. A huge positive from the creative destruction inherent in our space. I joined the venture community in 2006 and was a partner at Accel London. Accel was a great apprenticeship and platform to forge strong relationships with many entrepreneurs and fellow investors, and investments I led there included Etsy, MyHeritage, Seeking Alpha, and Knewton. From 2010-13, ahead of starting Mosaic, I invested in the European (and US) startup ecosystems with my own capital, often alongside Index Ventures -- where for a time I was affiliated as a Venture Partner. Notable investments in this period include Squarespace, ResearchGate, Enfore, Shapeways, and Appcard (all Series A); as well as Fotolia and Etsy (at growth stage). Outside the startup world, I live with my Danish girlfriend and enjoy reading, yoga and nature. DLD - Bitcoin, Blockchain, whats the buzz?